Posted on July 30, 2018. Last modified on August 10, 2018. Read Disclaimer. A small, bushy tree that grows in the swamps of South America's Amazon rainforest, the camu camu tree has recently attracted the attention of health researchers because of the berries it produces. They are roughly the size of a lemon, extremely tart, and amazingly rich in vitamin C... in fact, the camu camu fruit packs the highest concentration of vitamin C of any plant on earth... 30-times the vitamin C concentration of oranges! Now, you may be saying to yourself "So what if Camu Camu has such concentrated vitamin C... I'll simply eat more oranges!" Studies suggest that camu camu berries provide a lot more than just the vitamin C that's made them famous. They contain many other free-radical fighting antioxidants and anthocyanin compounds that may play a role in helping prevent or delay a variety of chronic and degenerative diseases such as Type 2 diabetes, certain cancers, arthritis and heart disease. An especially interesting research paper focused on the potential for camu camu at controlling oxidative stress and inflammation in the body that's associated with hardening of arteries in smokers. Some of the participants in the study drank camu camu juice while the others consumed a comparable amount of vitamin C alone. After just 7 days, blood and urine samples showed significantly lower oxidative-stress and inflammation markers in those who were consuming the camu camu fruit juice. The researchers surmised that "unknown substances" in camu camu -- other than vitamin C must be contributing to some of the health benefits it provides. 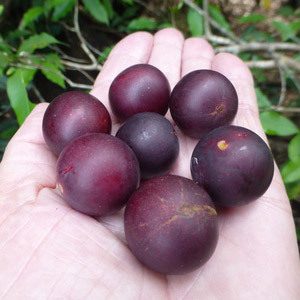 Why Can't I Buy Fresh Camu Camu Fruit? Are there any camu camu side effects? Though it is more common outside the U.S., iron deficiency can be a concern for toddlers (under the age of 5) and women of childbearing age (ages 12-49). And Vitamin C tends to reduce bioavailability and absorption of iron of other foods. So, while the high levels of antioxidants found in camu camu may be helpful in protecting us from chronic disease, persons at risk for iron deficiency may want to consult with their health care provider before consuming camu camu. Have anything to add about of camu camu and/or concerns? We'd love to hear your feedback!